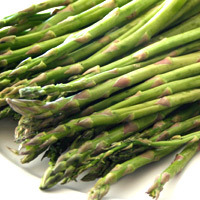 Growing up my neighbors had an abundant supply of asparagus in their garden. They gave some to my mom almost weekly. I never liked it as a kid, but my parents always had us eat a few bites. I love it now thanks to them and our generous neighbor. The rule at my house now is if there is something you don't like, you say, "I don't like it yet." Someday my kids will thank me. 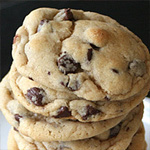 Size- different varieties have different sizes, some thin, some thick, all are long. Sold in bunches. Different colors are available regionally. In the United States, green is the most common. 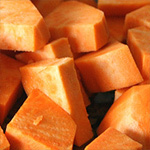 Selecting- choose stems are that are crisp, smooth, round, straight, and have a good color. Avoid those that are wrinkled and limp. 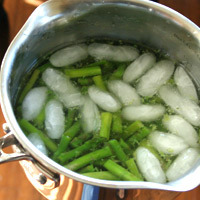 Freeze- blanch, dry, and freeze up to six months. Select a stem from the bunch and bend. The woody end will snap off. 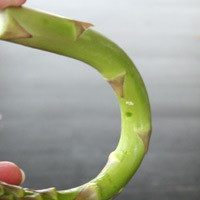 Using this as a guide, line up the tips of the stems and trim off the ends to be the same length. The ends are edible, just woody and tough. If you want to keep them on, peel them with vegetable peeler to the tender center. Rinse under cold water. Pat dry with a paper towel. Line up the ends and trim them off with a knife. 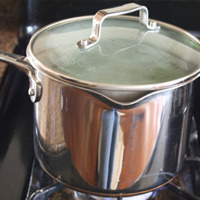 Bring a medium pot of water to a boil. Add 1 1/2 t salt. Add the asparagus. Boil 3-5 minutes until bright green, cooked through yet still crisp. Toss with butter, salt, pepper, and seasonings. The ends break off according to the age of the asaparagus. 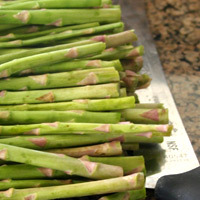 Fresher asparagus will be good almost all the way to the ends. 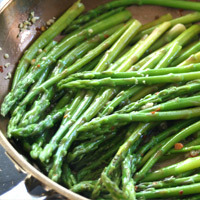 Older asparagus may only be good to the middle. Any given bunch should be the same age, so only one piece is needed for the bending test. The rest can be cut. The boiling time depends on the size of the stems. 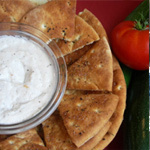 Thinner varieties will cook quicker than thicker. Undercooked stems are hard to chew and don't taste very good. Overcooked stems get mushy and turn a olive green color. Follow the instructions above up until the boiling time. Boil only 1 minute. Drain and transfer to an ice bath to stop the cooking, about 5 minutes. Drain water. 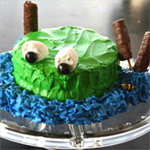 Dry on paper towels and freeze in a plastic bag 4-6 months. Use the above method to cook and season when ready to use.